It’s that fuzzy time of year again when people return home for the holidays, families come together and we look back on another year along the Wild Atlantic Way. 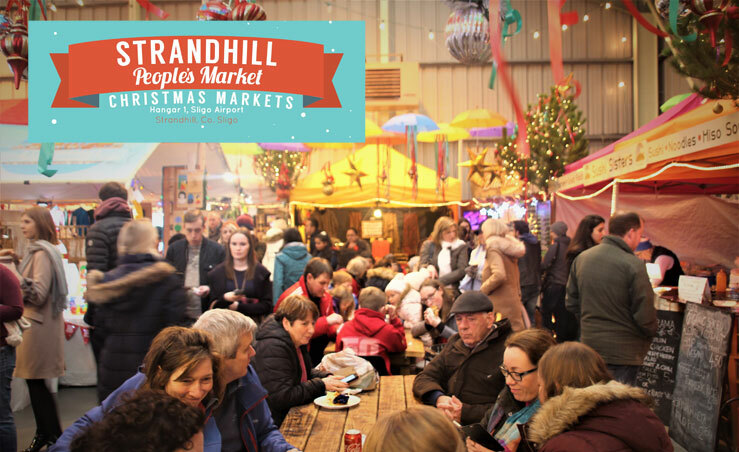 There’s no better place to meet an old friend, go shopping with the family or grab a bite to eat with work colleagues than at Strandhill People’s Market. The event now boasts over 100 stalls on their books meaning that each market has different stalls on offer and more choice for you. This December SPM are hosting 7 markets, open every Friday 5-9pm and Sunday 11-4pm throughout the month. If you’re not convinced just yet, here’s 10 reasons to get you going! When shopping this Christmas remember that every €10 spent at Strandhill Market generates €24 of benefit to the local community in Sligo. Whether you’re looking for jewellery, artwork, clothes, hand made slippers, soaps, face creams or almost anything else for that matter, it’s all under one roof at Sligo Airport. 2. The man in the big red suit – Santa Claus! He flew in from the north pole on Sunday aboard the rescue chopper to a packed audience. He’s now planning to stay put and enjoy some Sligo sights during the week and he can be found in his grotto at the airport every Friday 5pm-9pm and Sunday 11am-4pm. Friday night markets are the perfect excuse not to cook. If you’re lucky enough to finish work at 5.30 you’ll be spoilt for choice with sushi, paella, pizza, tacos, pasta dishes, Indian, Lebanese and more. No Friday night is complete without a beer to celebrate another successful work week. The White Hag Brewery will be on site selling brewery tours and of course a great selection of their beers. If this week’s weather warnings are anything to go by, it’s about to get pretty chilly! What better way to browse the stalls than with a coffee, hot chocolate or even a mulled wine in hand. Sure go on, it’s Christmas! 7. Grab all you need for that Christmas dinner! Buchanan Fruit Direct has one of the most impressive set ups and varied selection of vegetables. This stall will be present at SPM for every night market and every Sunday meaning you can buy your veg from Eddie throughout December up until the 22nd, right before you put the spuds in the oven for the big day. SPM hosts Barbelo Choclate, Black Sheep Bakery, The Cake Lady, Finner Fancies and a host of other stalls selling all you need to break those diet rules during December. Sure go on, that’s half the fun of the festive season! We all love to spoil our furry friends at Christmas and K9-Fit has all the products you need to surprise the pet in your family. Woof! SPM is ideally located near the beachfront at the very beginning of a great walk to Killaspugbrone church. If you’re feeling adventurous you can walk the loop all the way to the top of Knocknarea and back down through the village.